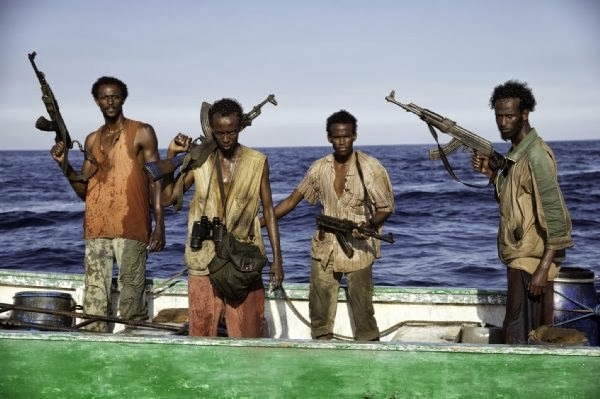 Captain Phillips is the tale of four brave, doomed Somali sailors. These are men that spend their days trapped in a nightmarish sand-blasted hell with an infinite desert behind them and an infinite ocean in front. This is a world where the life expectancy is a smidge over 50 years, where power comes down the barrel of an AK-47 and where life is about as cheap as it gets. Things used to be calmed here, the Somali waters were rich with tuna, fish and lobster – delicacies for a first world dinner table. But sinister entities regarded these azure waters with evil eyes, surreptitiously using them as a dumping ground for tonnes of nuclear and toxic waste. The result was birth defects, radiation sickness and abdominal haemorrhages among the inhabitants of the Somali coastline. At the same time foreign fishermen illegally moved into Somalia's seas, trawling the ocean floor clean, drastically depleting the sea life that Somalia needed to survive. If you're a Somali fisherman things were desperate. The outside world has shat on you, simultaneously poisoning your family and stealing your livelihood. Meanwhile, off on the horizon, like a ripe apple on the bough, cargo ships float serenely through your waters. They're carrying the bounties of the First World: money, cars, technology – all insured to the hilt by gigantic multinational shipping companies. Who could blame you for taking just a tiny bite of this tantalising apple? A minute fraction of their profits could rescue your entire village from poverty, set up schools, buy medical supplies – the sky is the limit! This is the situation that Paul Greengrass explores in Captain Phillips, which is based on real events. 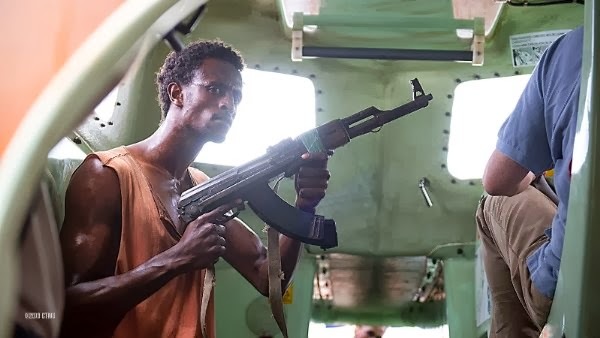 Our hero, a Somali fisherman named Muse (Barkhad Abdi), dons the mantle of a hero from antiquity as he sets out to the wild ocean in a flimsy skiff to take on the combined might of capitalism. Throughout the film he's defined as 'the little man': an individual framed against gigantic ships. These ships are the avatars of global capitalism and, appropriately, Muse is dwarfed by them, buzzing about them like mosquito trying to bite an elephant, tossed around by their chaotic wake. He becomes an avatar of Somalia itself: buffeted and powerless against exploitation, global financial trends and exploitative big business. Muse is a fascinating protagonist. He has to work hard to gain our sympathies, yet quickly we realise that for all his bluster he's a remarkably honest and straightforward individual. Sure, his outright desire for cold hard cash is plain avarice, but then put yourself in his shoes: US Dollars may as well be manna from heaven. Greengrass is careful to couch Muse's avarice as a reflection of the first world capitalism that's destroyed Somalia. Like many victims, Muse has learned from his torturers, distilling the cutthroat profit-at-all-coast philosophy that has destroyed his country into a purer form: pointing a gun at the representatives of big business and demanding money from them. His straightforwardness is contrasted with the overtly manipulative nature of the first world whites in the film. Every word from their mouths is a lie, and Muse and their crew become putty in their hands. They're lured into ambushes, tortured with knives and held ransom before being tipped overboard like so much garbage. As their situation becomes that much more desperate, the poor sailors find themselves surrounded on all sides by the might of the US Navy – hemmed in by billion pound warships, buzzed by autonomous drones, their emotional torment exploited by slick-mouthed Navy 'negotiators'. Barkhad Abdi's Muse is a stunning lead performance. His on screen presence is unique: a wiry skeletal figure, yet with a powerful inner strength manifested in his clear gaze and direct language. 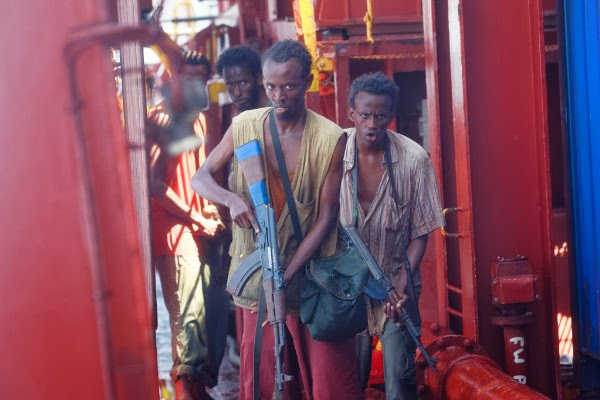 It's difficult to believe that Abdi has absolutely no acting experience prior to this film, but the authenticity he brings to the role elevates this from simple 'adventure on the high seas' to something greater. It's difficult not to get swept up his passion as he bounces through the wake of his quarry, an Ahab-like compulsion visible every facet of his body language as he urges his men towards victory. His crew, played by Barkhad Abdirahman, Faysal Ahmed and Mahat M. Ali are similarly impressive, with Abdirahman in particular doing a great job of playing a kid in over his head. These characters behave with such maturity that it's easy to forget their ages, yet the 16-year old Bilal shows the innocence and fear that the other men try so desperately to conceal. Tom Hanks is also good as the eponymous Captain. Paul Greengrass directs the hell out of this, his trademark 'shaky-cam' creating a sense of panicked immediacy, as though events are moving too fast for the camera to keep up with. I sympathise with those who are nauseated by this technique but here, given that the vast majority of the film takes place on the open ocean, a wobbly camera feels appropriate, as if we too are being thrown around by the waves. Greengrass' political intent is perhaps most keenly expressed with the arrival of the US Navy, who are depicted as equivalent to the Empire in Star Wars. As these battleships slice through the ocean we're reminded of the awesome might of the Star Destroyer in the first shots of Star Wars, subsequent internal shots recalling the control room of the Death Star. The US Navy may not actually have the firepower to destroy whole planets, but from our hero's perspective they might as well. Perhaps the only flaw in Greengrass' direction is a misguided attempt to humanise the antagonists. There are shots of a Seal Team suiting up, complete with a faintly pornographic focus on both bulging, greasy muscles and the highest in high tech killing equipment. The film would be better served if we stuck with our protagonist's perspective, viewing the villains as colossal, omnipotent hunks of metal, bristling with weapons and barking orders at them. Captain Phillips is a tremendous film, and its refreshing to see a First World director take the time to tell the story of those most victimised by the depredations of capitalism. I doubt this will usher in a new age of sympathetic and unexploitative depictions of Sub-Saharan Africa, but at least in this instance Greengrass treats his material with dignity, humanity and no small amount of intelligence. Recommended.